SAY CHEESE: Yorkshire's players prepare for the 2018 season during their recent media day at Headingley. YORKSHIRE are back for the 2018 season and begin their campaign in the County Championship on Friday, April 13 against reigning champions Essex at Headingley. And, as if they almost go hand-in-hand, your favourite Yorkshire cricket podcast is also back - kind of by popular demand - following a stop-start winter of activity. 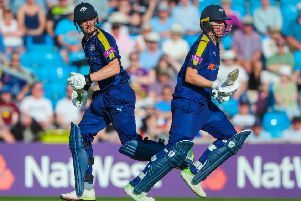 The Yorkshire Post's cricket writer Chris Waters is on hand to discuss the season ahead with host Phil Harrison, along with other topics such as the IPL and ball-tampering. Click on the link below to hear our 2018 season preview.